“I’m in LOVE with 3tree! You guys make me look sooo freakin good… it’s ridiculous!!!!!!!! Thank you for your partnership. The perfect item item to remind folks to drink responsibly and stay hydrated. These insulated water bottles were distributed at a Super Bowl event and featured custom printed neckers to incorporate additional brand messaging. 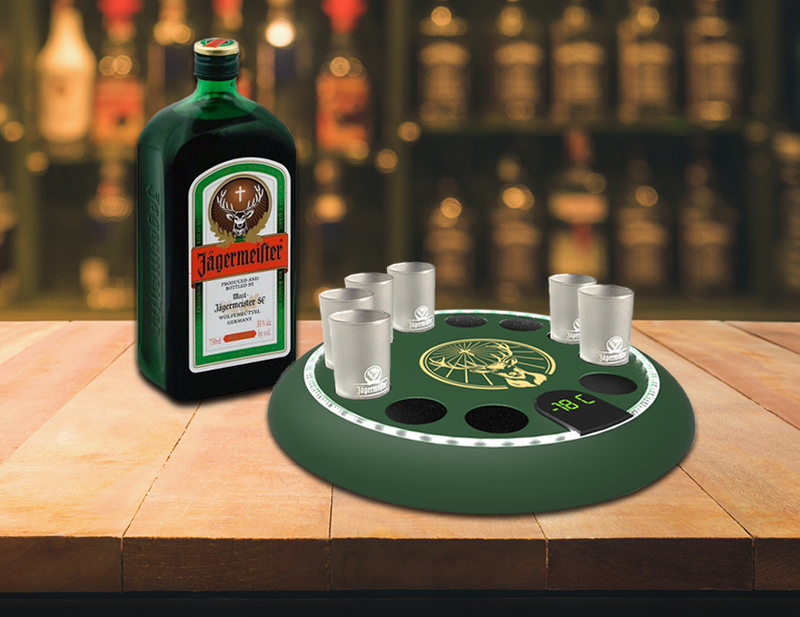 This custom shot tray was truly imagination becomes reality. From its custom shape to lighted elements, this tray made an excellent carrier for a perfectly chilled champagne shot. From table throws to retractable banners to full booths, we can provide quality display items to make your booth look great! A unique way to present product information and services—a 3-D book! This book comes complete with a pocket inside to hold 3-D glasses. This 3-D crystal desk award made the perfect groundbreaking ceremony gift for a new building. The actual architectural CAD drawings for the building were utilized in its creation! This luxury brand was in need of a premium giveaway for a test drive and win activation. 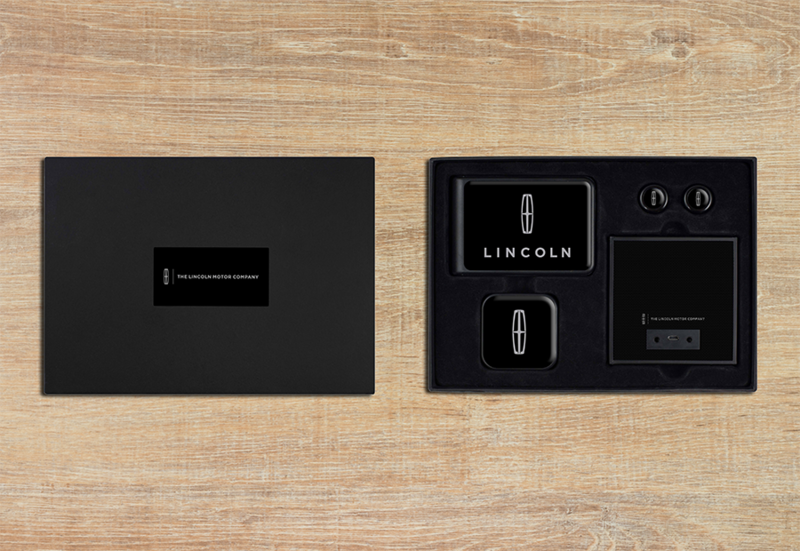 The kit featured a bluetooth speaker, battery pack, wireless, earbuds, Apple/usb cord, and custom packaging all matching the sleek style of the brand. This full size game needed the perfect graphics so our client turned to us to create realistic graphics and incorporate their branding to make the game fun and exciting! Need only 1 piece? 3tree was able to make that happen with this custom hockey jersey (yes, CUSTOM)! A unique ask- re-creating the Tag Scoreboard as a desk clock. Check out the similarities of this custom fully functional desk clock to the original! Need to increase traffic to your booth? Check out these custom wrapped charging stations! Custom printing at its finest! This cocktail book featured a premium leather-like cover, foil embossing, custom printed inside covers, and full color gloss pages. Custom packaging is important for distribution in the retail environment. Not only was the box for this speaker branded especially for Tag Heuer but the text that appeared when connecting was custom as well. Caps fit for a winning team! These caps feature multiple location embroidery, red taping and eyelet holes, and red underbill. Gameday giveaways HAVE to be special! 10,000 lucky fans received this mini-basketball featuring custom panels that included the Chicago Bulls Benny the Bull logo and the Advocate Children's Hospital logo. 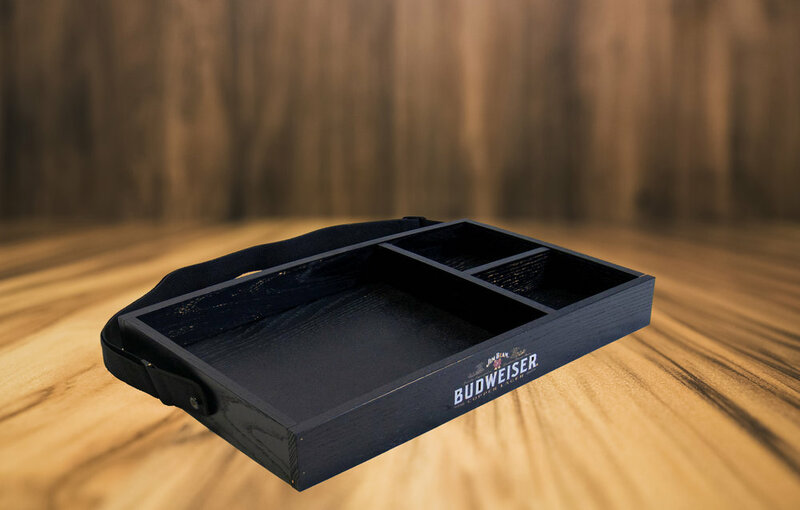 Great for sampling events, this custom wood tray with strap has sections to hold sampling cups and napkins. Happy Sampling! Custom printed playing cards can be a great giveaway. They can be everything from the standard card deck with a logoed back or they can be cards custom printed on the front and back to create your own game! The possibilities are endless. Thank you gifts are important and this one is no exception. These wood planter boxes featured a laser etched logo on the side and were packed with a bag of compost, seeds, and gift wrapped to be given to all visitors to a farm. No design project is too big or small. Our team took care in making the design reflect the look and feel of the brand the order forms were for. 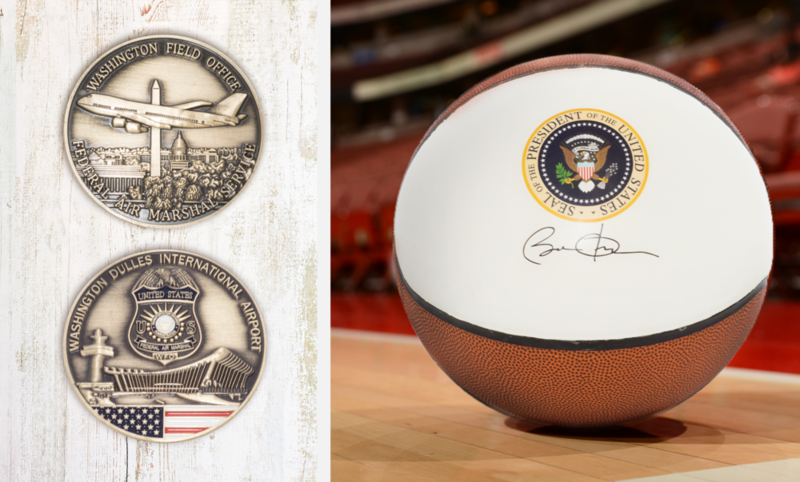 Trusted by one of the highest authorities in this country, 3tree has produced numerous items including basketballs, champagne glasses, pins, etc.. bearing the Presidential Seal. Check out these fun summer caps! They feature colorful floral fabric with a surprise oversized print on the underside of the bill. History as its best! 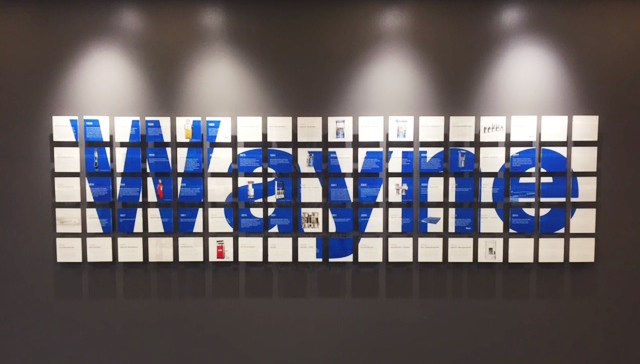 Custom acrylic tiles tell the story of this company. At a distance a simply looks like a logo but take a closer look and the tiles describe milestones in the company's history. Perfect for travel, this branded whiskey kit had everything needed to make an Old Fashioned using the brand's own whiskey. Cheers! Creating a cohesive look is what it's all about. These pieces can be worn separately or together to show off the brand. Probably the coolest magnet you'll ever come across. 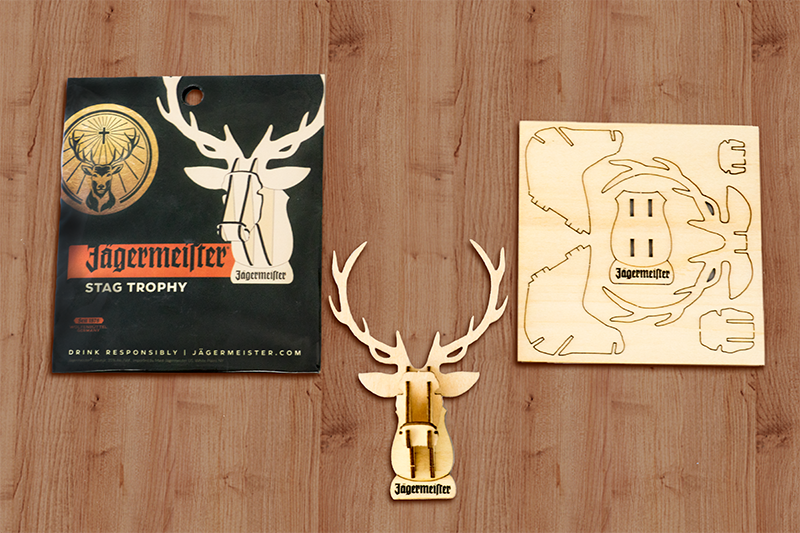 The piece comes as a punchout wood puzzle that when put together, becomes the shape of a stag head. This was produced complete with instructions and retail packaging. 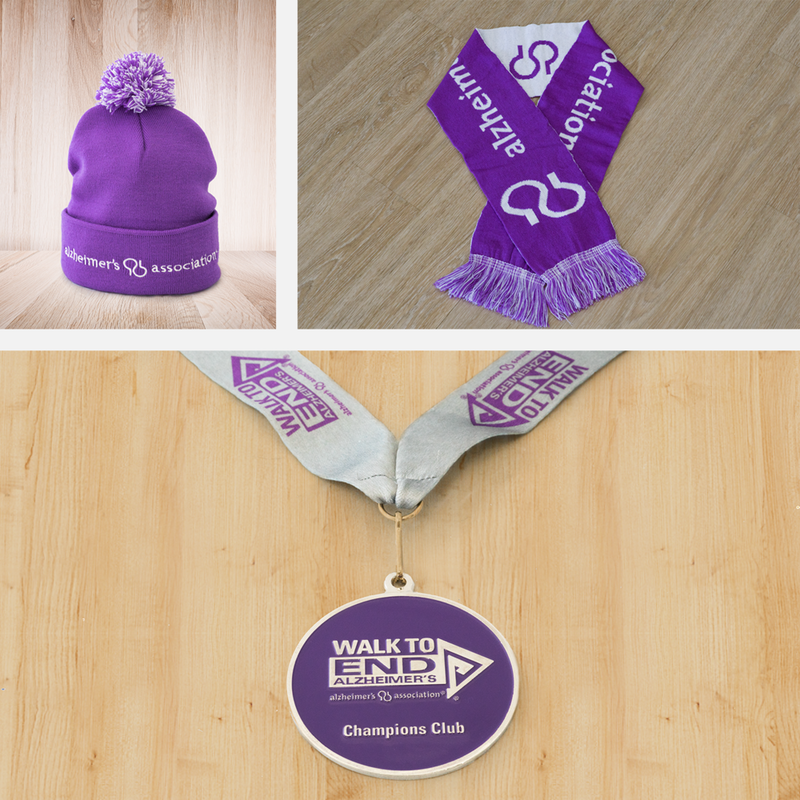 A way to recognize dedication to the fight against Alzheimer's, these awards are given to top fundraising teams every year. Wireless earbuds were key at this conference so we dressed them up! The custom packaging featured logos and imagery from the location of the event and even showed the brand’s name for the connection. We can assist with logo creation for all kinds of applications. 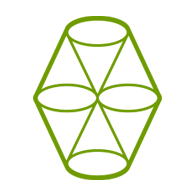 Check out this logo we created for a wellness initiative! The premium glasses feature a custom shape and volume not found in any other drinkware piece. The client asked and we delivered! No ordinary holiday card! This card came complete with fun punchout fridge magnets in the shape of snowman parts! Corporate trips can be something to get excited about especially when its to an exotic location. These branded view finders came with a custom reel showing pictures of the destination! 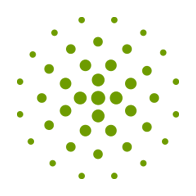 A go-to source for custom pins, 3tree can help design and produce pins for all brands. Outfitting brand ambassadors? No problem! 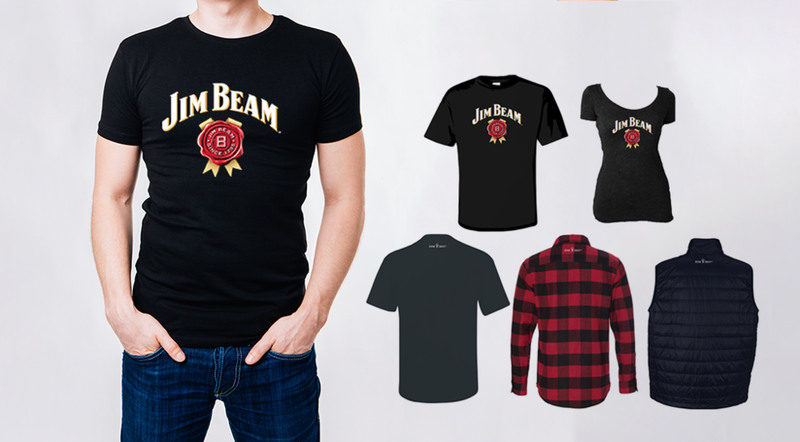 Check out these trucker caps and t-shirts perfectly matched to the brand. Perfect for an outdoor shopping mall, this custom umbrella featured a beautiful full color design across the panels as well as the storage sleeve. 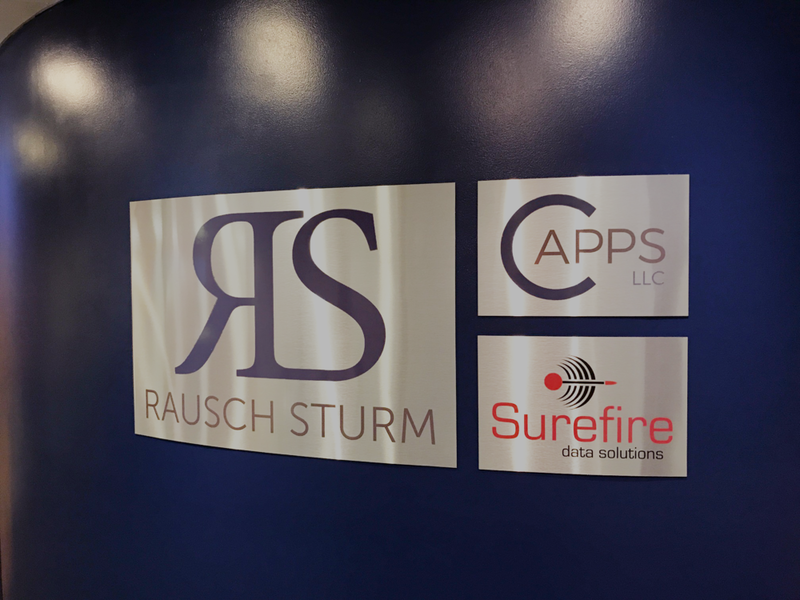 Does your office signage need an updated, contemporary look?Check out these custom printed acrylic signs mounted on brushed aluminum backers. Have specific people you want to visit your tradeshow booth? Send them a pre-show gift! This one contained a branded insulated tumbler with booth information to visit at the show and fill up with fresh brewed coffee in the booth. One of the best applications for dye-sublimation! 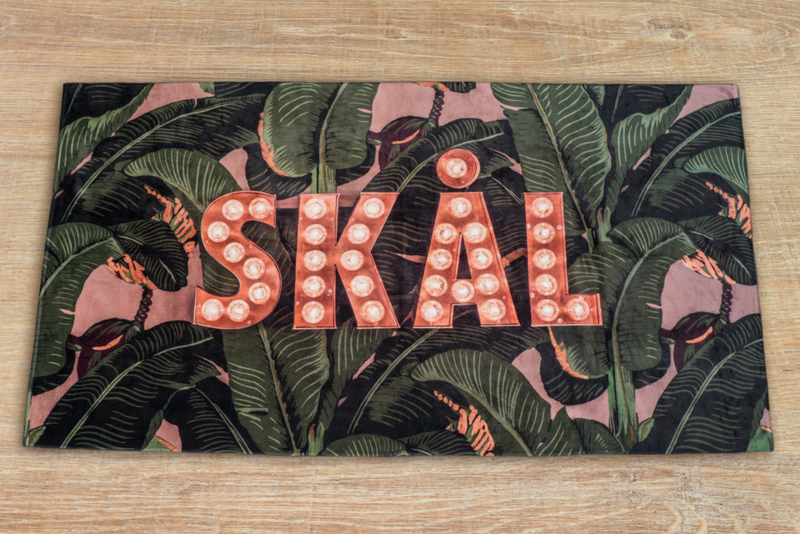 This 35" x 65" beach towel is an edge to edge blank canvas to showcase any imagery you'd like! This 5qt party bucket features a full custom graphic neoprene sleeve sure to help keep drinks cold as well as be an eye catching centerpiece on any table! What a way to light up the night! Everyone will take notice of your drink of choice with these custom light up stir sticks! Giveaways to VIPs at the Super Bowl have to be special. Check out this canvas traveler bag customized especially for this event! Branding can be placed just about anywhere- even shoes! Check out these kicks that are branded with full color graphics! Perfect headwear for a surf event, these straw hats conveyed the look and feel of the brand perfectly. Pillows are a fun way to display a brand for special events or as added decoration in an office space. They can be a standard square shape or custom and full color like this lime wedge shaped pillow! Ever wonder what your co-workers are cooking up? Check out this spiral bound cookbook created and made for the company's own employees. Awards don't have to be your typical engraved wood plaque or glass/acrylic award. 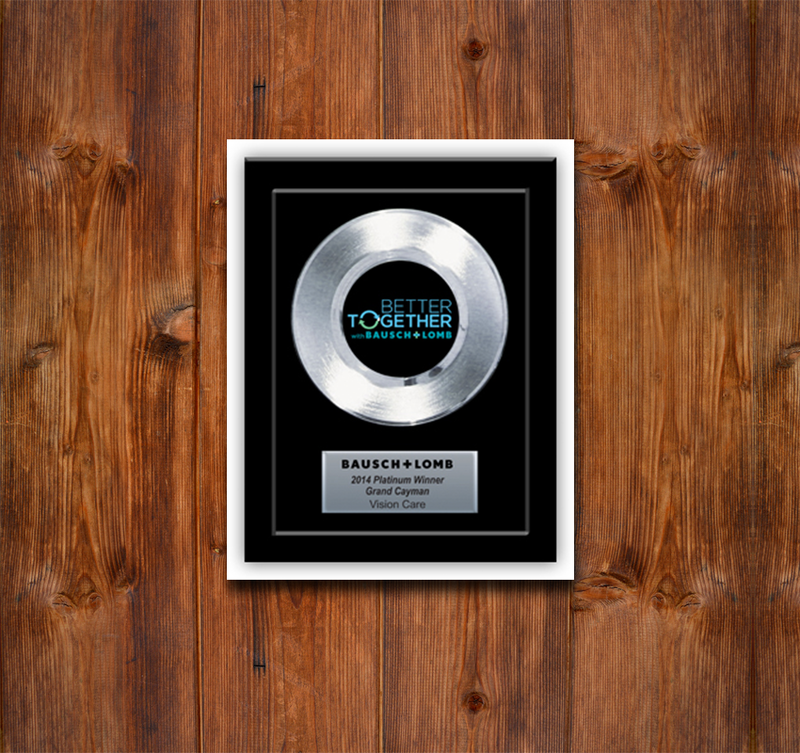 Check out this award featuring a record to make the recipient feel like a rockstar! With music at the heart of our culture, Rebel Yell wanted to give hard working musicians a special gift. Each kit included a branded canvas bag, socks, yo-yo, guitar pick, and journal. Including a card with a baby gift is important and we took it to the next level with this fun design! Classic to reflect the brand. This candle features a metallic imprint and is enclosed in a 2 piece black gift box. Fun swag to match the brand. This fully dye sublimated scarf features gold fringe to match the brand's gold color. These lighted interactive displays are a draw for people of all ages! They can be used to generate booth traffic at a tradeshow or simply to impress visiting clients by creating their logo on the display. Check out this thank you gift sent to people enrolling in fleet tracking services! 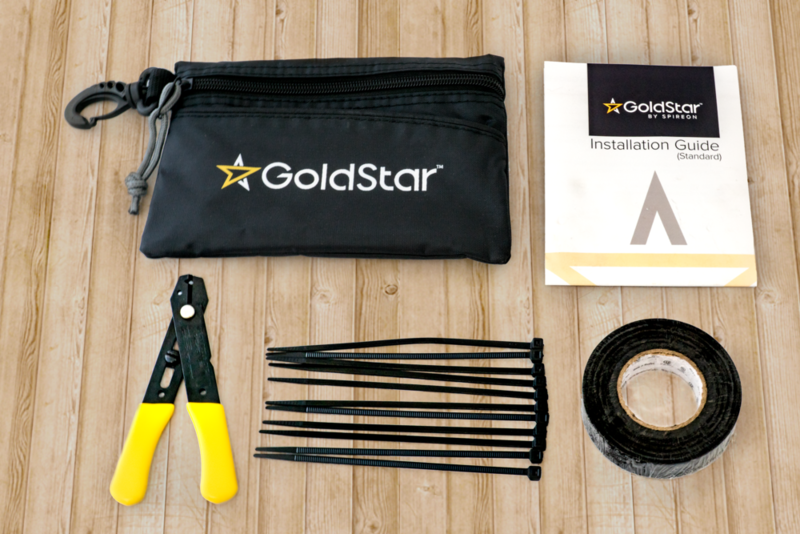 This kit contained everything needed for an installation including a tool, electrical tape, zip ties, and guide. Branded items for a cause. 3tree has produced t-shirts, caps, scarves, totes, awards, and more for this organization and their events. These caps share the overall look of the brand but represent each sub-brand well through custom patches and colors! Just about everyone can use a USB! We've produced many in a custom shape like this Corona beer can. 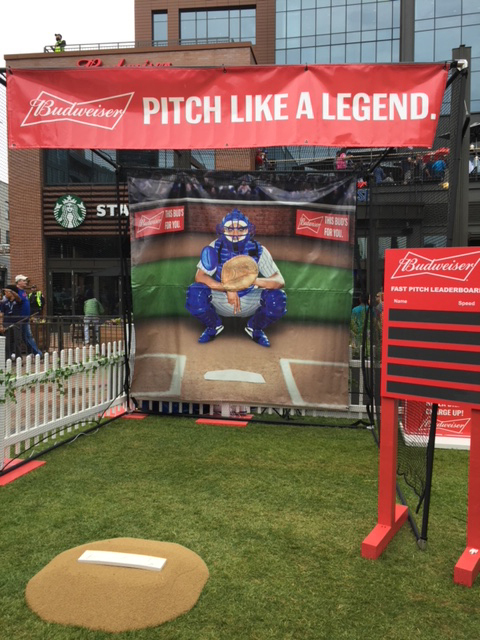 Aluminum tacker signs can be a great, durable way to display a brand. They can feature full color graphics and embossing to make logos and imagery stand out. What better way to motivate a sales team to achieve their goals? Send them a lookbook of the next location of the reward trip for the best of the best on the sales team! This hotel chain wanted to show appreciation to their client for choosing them as their stay for a week long event. Each room drop gift contained 2 champagne glasses and thank you card packaged in a debossed box. Our client needed some fun stickers and had ideas for the verbiage but wasn't quite sure about graphics. We put together these fun designs and the client was thrilled! 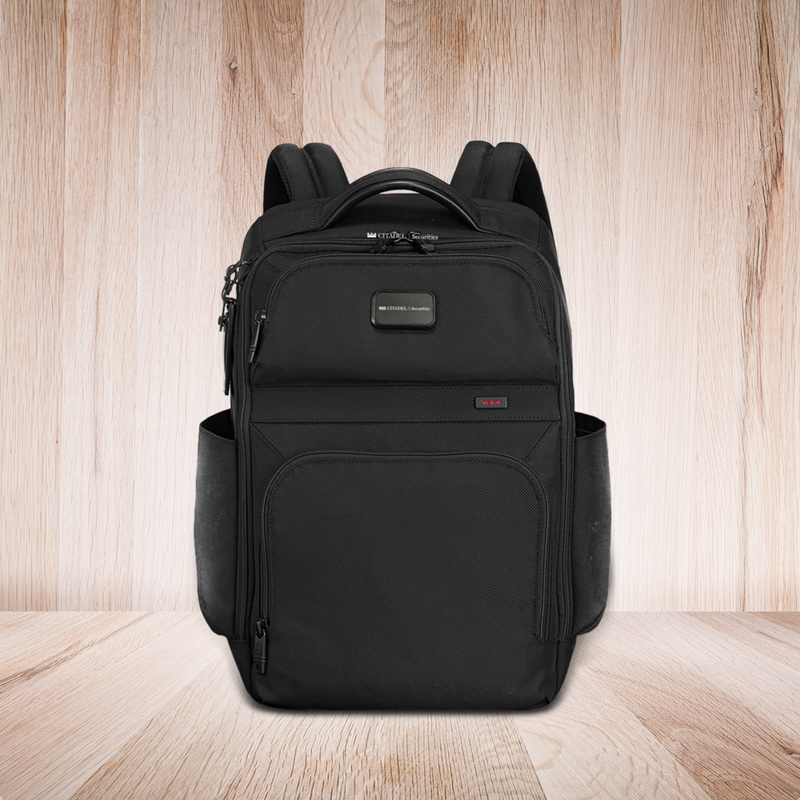 This sleek and functional Tumi backpack made an excellent employee gift. 3tree's fulfillment team distributed to our client's offices worldwide. A great talking piece at every table! These custom adirondack chair napkin caddies are the perfect holder for branded napkins.